Mutations in the progranulin gene cause a good many cases of frontotemporal dementia (FTD), the most common form of early onset dementia. But not everyone with a progranulin mutation gets FTD—some lucky souls are protected by variants in a second gene, TMEM106B. While the genetic interaction is clear, just what TMEM106B does in the cell, and how it overrides destructive progranulin mutations, has been a mystery. Now, a TMEM106B knockout mouse, generated in the lab of Stephen Strittmatter at Yale University, New Haven, Connecticut, shows that the protection takes place in lysosomes. These organelles, the work suggests, are the battlefields where both genes regulate protein degradation in opposite directions. Their respective effects also diverge: Knocking out progranulin caused neuronal death and behavioral deficits, while removing TMEM106B from the progranulin knockouts prevented both these phenotypes. 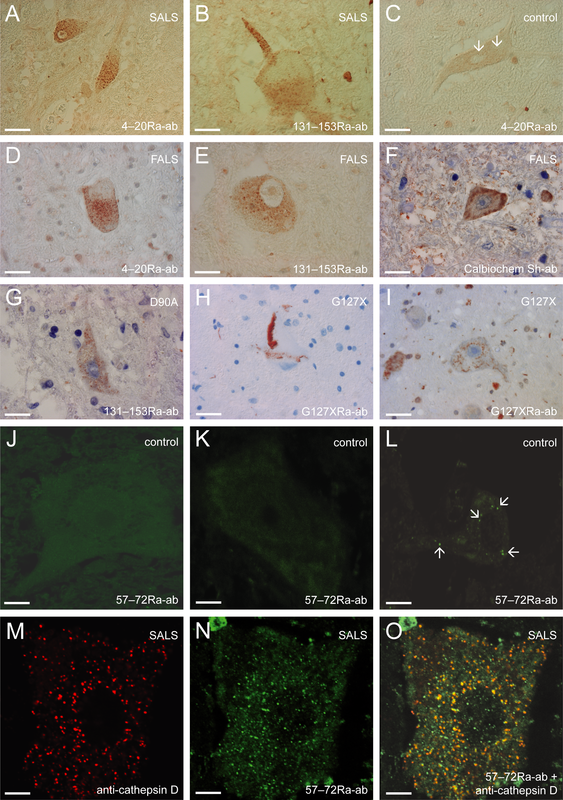 Published in the July 19 Neuron, the work shines a spotlight on lysosomes not only in FTD, but also in a growing number of related conditions, including Alzheimer’s, where TMEM106B affects risk. “The important finding in this paper is the involvement of lysosomal function in the pathway to neurodegeneration,” said Daniela Galimberti, University of Milan in Italy. “A number of studies in humans implicate TMEM106B or progranulin polymorphisms in a list of different diseases, and nobody has had an explanation for these associations. So this information can be useful in many fields of neurodegeneration,” she told Alzforum. The paper’s limitation is that genetic knockout poorly reflects how genetic polymorphisms lead to disease in humans, said Galimberti. “We start from the mice to get to very basic mechanisms, but we have to think carefully about how to translate these findings to humans because the model is artificial,” she said. TMEM106B does not cause FTD, but it affects if and when people with progranulin mutations, or other causal mutations, get the disease (see Feb 2010 news; Sep 2016 conference news). Pathogenic progranulin mutations cause a loss of progranulin protein production, and protective alleles of TMEM106B boost plasma progranulin levels. This led to the idea that TMEM106B’s protective effect lay in reconstituting progranulin function. TMEM106B is a transmembrane protein that resides in lysosomes and regulates their function (Brady et al., 2013); however, the actual mechanism by which it modifies neurodegeneration is unclear. In the new study, first authors Zoe Klein and Hideyuki Takahashi set out to explore how TMEM106B functions and how it interacts with progranulin. They first examined an existing mouse strain lacking Grn, the murine equivalent of the human progranulin gene. The knockouts develop microgliosis, a feature of FTD, and retinal neurodegeneration, a feature of the granulin-related disease neuronal ceroid lipofuscinosis (Hafler et al, 2014). The researchers exhaustively catalogued changes in gene expression and protein levels, using whole-transcriptome sequencing of mRNA from cerebral cortices of two-month-old mice and proteomic analysis of membrane organelles from their forebrains. Both exercises pointed to an early upregulation of lysosome function. In a gene ontogeny analysis of mRNA and protein data, lysosome function topped both lists as most affected in the knockouts compared to wild-type mice. Among 364 mouse lysosome genes, 29 changed expression and 19 altered their protein levels. Of those, the majority went up. That upregulation was accompanied by lifelong increases in activity of lysosome enzymes in the brain. Overall, lysosomal proteolysis in cultured primary cortical neurons jumped by one-quarter in the knockouts compared to wild-type. In contrast to previous studies (Oct 2012 news), the analysis showed no effect on microglial markers of inflammation in these mice but did reveal upregulation of innate immune proteins of the complement system. For TMEM106B, the authors created a knockout and performed a similar transcriptome and proteome analysis. Surprisingly, gene transcription in these mice was minimally affected—in total only 54 genes were differentially expressed between the null mice and wild-type littermates. The only differentially expressed lysosomal gene was TMEM106B itself. However, at the protein level, things looked different. Several of the same proteases that went down in the progranulin knockout went up when TMEM106B was absent. Given the opposite effects of the knockouts, and the human genetic interaction, the researchers crossed the two strains. In the double-null mice, lysosome function normalized: Protease levels and overall proteolysis returned to wild-type conditions when both genes were gone. Curiously, the TMEM106B knockout selectively affected lysosomes, not other phenotypes of the granulin knockout. For example, loss of TMEM106B did not alter lipofuscin accumulation, or expression of the microglial markers CD68 or complement C1q. How might TMEM106B affect lysosome function? The scientists discovered that several subunits of the vacuolar-ATPase were downregulated. V-ATPase is an enzyme that makes lysosomes acidic, and cortical neurons cultured from the knockouts contained less acidic lysosomes. Co-immunoprecipitation indicated that TMEM106B directly associates with the enzyme’s AP1 subunit. Knocking out progranulin had no effect on V-ATPase. The results suggest that, in the double knockouts, reduced V-ATPase activity somehow normalizes lysosome activity. In support of this idea, the V-ATPase inhibitor bafilomycin A mimicked the effect of knocking out TMEM106B, decreasing lysosomal enzyme levels and proteolysis in cultured progranulin-null neurons. What about the behavior phenotype? That, too, returned to normal in the double knockout. Progranulin-null mice are hyperactive; this hyperactivity in an open-field test came down to wild-type levels when TMEM106B was absent. Also, the progranulin knockouts venture out boldly in the elevated plus maze, which may be a model for the disinhibition FTD patients exhibit. This behavior, too, abated in the double knockouts. So did neurodegeneration: The double knockouts preserve retinal neurons that die in progranulin-null animals. In people, the twin findings that progranulin mutations are loss-of-function and that TMEM106B variants boost serum progranulin have suggested restoring progranulin levels as a therapeutic approach to FTD (Finch et al., 2011). The new work suggests that modifying lysosome activity might be another avenue. Perhaps the two are related? Several years ago, Anja Capell, Christian Haass and colleagues at Ludwig-Maximilians-University in Munich reported that bafilomycin A, the same V-ATPase inhibitor used in the new work, attenuated lysosome acidification and proteolysis, and boosted progranulin production in neurons from patients with progranulin loss-of-function mutations (Feb 2011 news). On the other hand, the double knockout mice in the current study suggest that holding neurodegeneration at bay does not absolutely require that progranulin be present. Curiously, in vitro studies reported that overexpression of TMEM106B hampers lysosome acidification (Aug 2012 news; Busch et al., 2016), while the current study observed this same effect by knocking out TMEM106B. The authors speculate in the paper that when it comes to TMEM106B, perhaps too much is as bad as too little, and cells need to get it just right to function properly. Strittmatter declined to be interviewed on the record for this story. What’s next? Galimberti would like to see additional analysis of the wealth of gene expression and proteomics data generated for the knockouts. “We have a lot of information here in the list of genes described as over- or underexpressed. Now we have to look into the pathways, and go in depth to study each candidate to try to understand the story of neurodegeneration in these mice.” With luck, that may reveal new therapeutic targets, she said. Klein ZA, Takahashi H, Ma M, Stagi M, Zhou M, Lam TT, Strittmatter SM. Loss of TMEM106B Ameliorates Lysosomal and Frontotemporal Dementia-Related Phenotypes in Progranulin-Deficient Mice. Neuron. 2017 Jul 19;95(2):281-296.e6. PubMed. Hafler BP, Klein ZA, Jimmy Zhou Z, Strittmatter SM. Progressive retinal degeneration and accumulation of autofluorescent lipopigments in Progranulin deficient mice. Brain Res. 2014 Nov 7;1588:168-74. Epub 2014 Sep 16 PubMed. Busch JI, Unger TL, Jain N, Tyler Skrinak R, Charan RA, Chen-Plotkin AS. 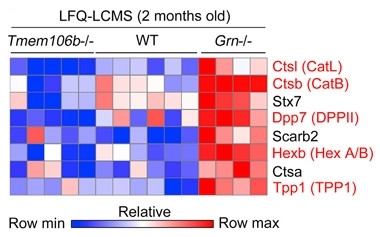 Increased expression of the frontotemporal dementia risk factor TMEM106B causes C9orf72-dependent alterations in lysosomes. Hum Mol Genet. 2016 Apr 28; PubMed.